Sister Maria de Jesus was nominated abbess on March 19, 1627, after that the founder nuns of the convent of the Gentleman of Grace were returning to Madrid; for not having yet 25 years of age, it was necessary to ask for papal dispensation. When she was nominated an abbess, position that, Mother Ágreda, accepted because the obedience was imposing it on her, the first thing that she did was to place in the principal chair of the choir (chapel of the convent) an image of our Lady of the Conception, to whom she called Abbess and Superior of the monastery, being reserved for herself the title of vicar and substitute. She put to the feet of the image of the Virgin, as sign of being their “Prelate” the book of the Rule and Constitutions of the Order and the stamp of the convent; it is for this one reason for which, to this image, the nuns call it affectionately “The little Prelate “. Also, there is begun the building of the new monastery to the suburbs of the village, although it is true that, since 1624, they had already the area, the construction began when Mother Ágreda assumes the abbess’s position. Though with scanty means, the work lasted only seven years, already on June 10, 1633, with “Great joy of the village” the religious ones moved of the former house to the new monastery. They all were admired of seeing how ” a poor religious one, barefooted and so reduced of human means, she was tackling and concluding in a few years a construction as big as a convent and church, everything of floor and of the tidiest and curious that can be said… “Maria de Ágreda was a woman of big works in spite of the fact that she always wanted to be secret in the loneliness of her cell. In the year 1652 there was carried out the foundation of the Monastery of the Concepcion of Borja, the Mother Ágreda was writing encouraging and consoling to the four founders sisters in order that they were continuing forward the work begun by the Lord. Themonastery in Tafalla, nowadays in Huarte (Pamplona), and the one in Estella, in Navarre, both of them were founded after the Sister Maria de Jesus’ death in the years of 1671 and 1731, respectively, because of the great devotion that the founders were professing to the Mother Ágreda. But, let’s see a bit the Sister Maria de Jesus’ mien as abbess. The being named abbess represented for her such a loss, dread, humility and confusion, that she was not stopping crying, and always that she reminded what she was, she was crying and was grieving. Nevertheless, she governed with zeal, observance, discretion and prudence; the fruits were seen in: a community fills of fervor spiritual and provided in their material needs. One of the Mother Ágreda’s major worries, was the spiritual care of her religious ones; this was making her suffer very much because she was wishing that they all were coming to a spiritual union with God, not for vainglory, but for the good of their souls: ” The major work of my trade, Sister Maria writes, is that my desires of the perfection of the religious ones exceed to what they can act, and that I want to regulate and to measure with the light, doctrine and the highest education that the Lord has given me. ” “And since it is not possible to obtain it, and I am vehement in the affections, I live crucified, hurt ” ” Only I could console or detain the fact that they were better than I, and that in everything take advantages to me; but the charity and zeal, I do not know what is had that it does not calm me down for the God’s service and good of the neighbor.” Because of it she was not losing occasion to remind them with conversations, doctrines; she was doing challenges to them after that were going out of the spiritual exercises to make them more fervent. She was taking advantage of the conferences, the recreation, to stimulate them to the practice of the virtues, especially of the charity for with God and with the neighbor. She wrote many advices in order that they were improving in the holiness; and, especially, she was passing many nights in prayer asking God it was not allowed that any of the religious ones should turn aside of the way of the virtue ever. With the same zeal of the salvation of the souls she was helping them being sick or close to die. She was visiting and consoling the sick nuns and was trying that they were lacking nothing. She herself was feeding them, was treating and cleaning them. To those who were in the article of the death, beside insuring itself that should give them the Sacraments, she was attending constant in her head-board, igniting them in God’s love and contrition of their sins, in order that they had big desires to see the Lord and enjoy him in the celestial mother land. And finally, in the distribution of the offices she was never looking at the persons but at the merits. Without persons’ meaning she was giving the charges to those religious that in God’s presence she believed more suitable, up to such a point one carried evenly that there was no gossip on the part of the religious ones ever. 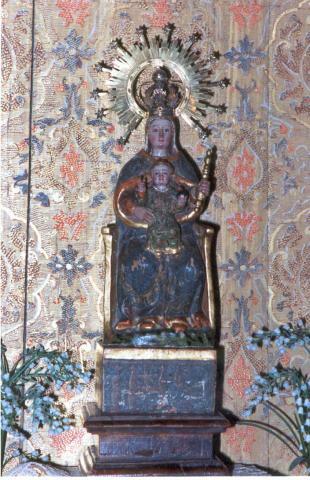 The Mother Ágreda directed the community and the monastery of such a way, which occupied the abbess’s post for ten years for direct appointment of the Religious Superiors and, then since in 1638, right of election was granted to the community, she was chosen triennium after triennium up to her death (1665). Only the chain was interrupted for the triennium 1652-1655, in that she itself achieved of the Apostolic Messenger, Julio Rospiliosi, that one was denying the dispensation of the reelection.